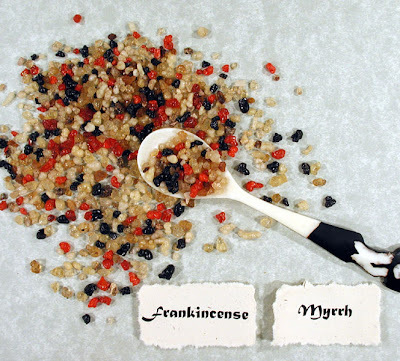 ein hod: frankincense & myrrh. From earliest history until today, fragrant, alluring smells have been regarded as essential elements of civilized relationships. Exotic plant odors and the scents that could be utilized for body application have inspired explorers, aristocrats, writers, poets, merchants and priests, and they have been of fundamental relevance to religious practices and to courtship. Many societies have felt that the burning of fragrant woods provides an ideal, ethereal token of appreciation to their gods. The liberation of incense smoke was a source of perfume: this word comes from the Latin per fumum, “by smoke”. Incense is a word that means “that which is lit”. The main incense fragrances were frankincense and myrrh. The sophisticated Greeks greatly appreciated such aromatic sources (aromata) as the turpentine tree, and this became an important import. They also valued the older Egyptian fragrant woods, and their exudates, such as those of myrrh, frankincense (olibanum) and cinnamon. Enormous amounts of money were spent on these exotic imports. The Greek island of Chios was the source of the valued gum exudate mastic as well as turpentine; the mastic was also used as a sort of chewing gum, and it gave rise to the word masticate. The more precious perfume incenses and spices came as imports through Arabia along well-established incense routes to be eagerly purchased by Mediterranean merchants who sold them to satisfy the increasing demands of markets throughout Europe.